Want a fast, effective and cost efficient way to clean all the surfaces of the workforce? Livingstone Detergent Wipes are an ideal solution. The latest addition to the Livingstone International wide range of cleaning supplies, these wipes are the economical solution to cleaning all surfaces in one go. Liv-Wipe Detergent wipes are detergent based and completely alcohol free. These wipes are made of durable & tough, non-woven material, ideal for cleaning of surfaces. Liv-Wipe detergent wipes are scented with apple fragrance. 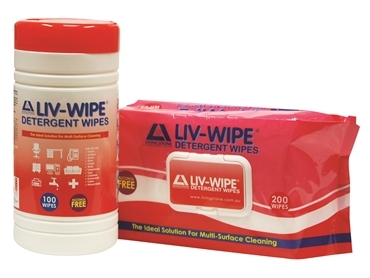 Liv-Wipe detergent wipes are an ideal solution for all surfaces at the workplace. Before being disinfected, a surface must be cleaned and free of any physical dirt, dust or filth. This is where our alcohol free detergent wipes come in. Made of strong durable materials, Liv-Wipe detergent wipes make the perfect multi purpose cleaner ideal for most medical surfaces, in the office or around the home. These wipes are also ideal for damp dusting. Liv-Wipe Detergent wipes are available in a dispenser tube (100 wipes – 20x30cm) as well as a flat pack (200 wipes – 22x28cm). Both options come in a dispenser style making it ideal for cleaning on the go.